Sadly, women are raised differently from men all the world over. From a very young age, most girls are not given the same rights, the same freedom as their young counterparts. No country is perfect when it comes to how women are treated. Not a one. Somewhere, somehow, there is a gender gap caused more by attitude than ability. 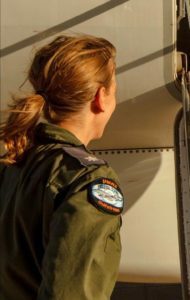 According to YNET, although Israel has had women as fighter pilots for some time now, this is the first female flight squadron commander. Apparently Haaretz disagrees and says that we accomplished this in January, 2018 with another woman, also married and a mother. No matter whether Major G. was the first or Lt. Co T. who came first, the bottom line is that little Israel joins only a few other nations in allowing a woman to serve as a fighter pilot, never mind a squadron leader. In fact, along with Israel, only the United States and the United Kingdom, South Korea and South Africa and Pakistan allow women to serve in this way. To be just what they are…. What makes this an even more amazing accomplishment is that both of these women, Major G. and Lt. Col. T. are not just fighter pilots, but wives and mothers. Women serve in Israel in a number of roles – from support to combat, and now, to fighter pilots. No, it doesn’t close the gender gap – not in Israel and not around the world. And no, it doesn’t mean that women in Israel are paid the same rate as men for doing the same job. But we have had women serve in the highest levels of government and now we have women serving in the highest places in the skies over our country.